Nathan Jones tweeted to say it rips his heart out to leave Brighton after taking over as Luton Town manager last night. Jones was first-team coach at Albion, after he was previously assistant head coach to Oscar Garcia and assistant manager to Sami Hyypia. He also played for the Seagulls for five years from 2000 to 2005. Albion gave Jones permission to talk to League Two Luton on Tuesday, concerning the vacancy at Kenilworth Road, and he has subsequently agreed a contract until June 2018. Seagulls chairman Tony Bloom said: “Nathan has been a great servant to the club, both as a player during the Withdean years, and more recently as part of the backroom team as assistant manager and first-team coach. Albion manager Chris Hughton added: “The club has been aware of Nathan’s ambition to become a manager for some time - and we all would like to wish him well in his new role. Albion agreed compensation with Luton Town, prior to Jones being given permission to speak to them about their manager’s job. Jones was on the books at Luton as a youngster in the early part of his career, without making a first-team appearance for the club, before moving to Spain with Numancia. He returned from Spain to join Southend in 1997, and first arrived at the Albion in July 2000. He played 183 times during a five-year spell with the club, either at left-back or on the left side of midfield. After leaving Albion he spent seven years at Yeovil Town, where he was player assistant manager during the latter stages of his time there; he moved to Charlton as under-21 coach in 2012. He joined Albion as assistant head coach in July 2013, initially under Oscar Garcia, and was assistant manager during Sami Hyypia’s time in charge. 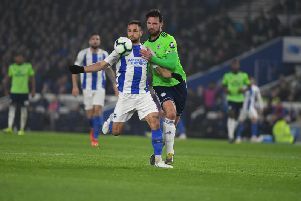 Jones took caretaker charge of Albion at the end of 2014, and oversaw a two-game spell, which saw Albion pick up a vital draw with Reading and an important win at Fulham, ahead of Hughton’s appointment as manager last New Year’s Eve.